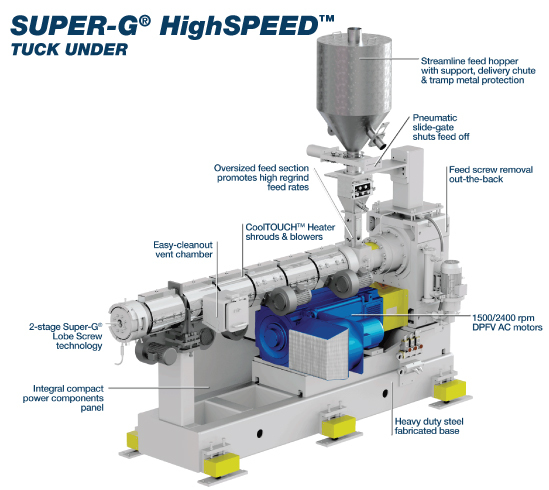 SUPER-G® HighSPEED™ extruders offers high overall system outputs while occupying a very small machinery footprint, truly a High Density Manufacturing Solution! The image pictured above features a co-extrusion HighSPEED™ complex for processing PP at rates in excess of 3,000 lbs/hr running ABA structures and is close-coupled to a 5-roll G-SERIES® Configurable roll stand. Super-G® HighSPEED Extruders are offered in SGHS3000-36D and SGHS3000-42D models are suitable for processing of polypropylene (PP) and high-impact polystyrene (HIPS) in the packaging industry. SGHS3000-36D and SGHS3000-42D are equipped with 500 HP motor with a maximum speed of 1000 rpm and 600 HP motor with a maximum speed of 1200 rpm respectively. SGHS3000-36D delivers production output of up to 3,000 lb/hr. The extruders come with carbide-lined barrels and Colmonoy hard-faced feed screws. Out-the-back screw removal features a quick and easy method for feed screw insertion and extraction.